Could Vinyl Be The Next Big Thing (Again)? Generally, with each advance in technology, the outdated product gets left behind and fades from existence. The computer killed the typewriter, the car killed the horse-and-buggy, and video killed the radio star. The same has held true in the music industry, until recently. The cassette tape replaced vinyl, the CD overtook the cassette, the mp3 player conquered the CD, and streaming dispelled the mp3 player. However, since the valley of vinyl sales in 2006, the seemingly outdated medium has undergone a resurgence in the United States. Is this rapid return just a fad, or will the vinyl market continue to grow? Vinyl records once ruled the way people consumed music. At the peak of vinyl sales in 1978, more than 340 million people bought albums. By 1991, that number had plummeted to 4.8 million. Sales continued to drop until the market bottomed out in 2006 at 900,000 units. However, rather than vanish into the abyss, vinyl has rampantly returned to shelves across the country. Since 2009, sales have steadily increased, reaching 14.3 million units last year. The sales numbers for 2018 suggest even further growth, signifying vinyl’s launch back into the mainstream. At a time when most in the industry predicted the technology would disappear, vinyl will experience a record-setting year in the modern era. By even the most conservative of estimates, vinyl sales in 2018 are up 17.6% compared to the same period in 2017. While the estimated sales for 2018 are expected to reach 20 million, these numbers alone do not provide a completely accurate picture of the market. The sales numbers released by RIAA (Recording Industry Association of America) only include new sales, meaning that the massive market of used vinyl is completely ignored. These numbers may also be drastically low because a large portion of new sales goes unreported to the agencies that keep track. 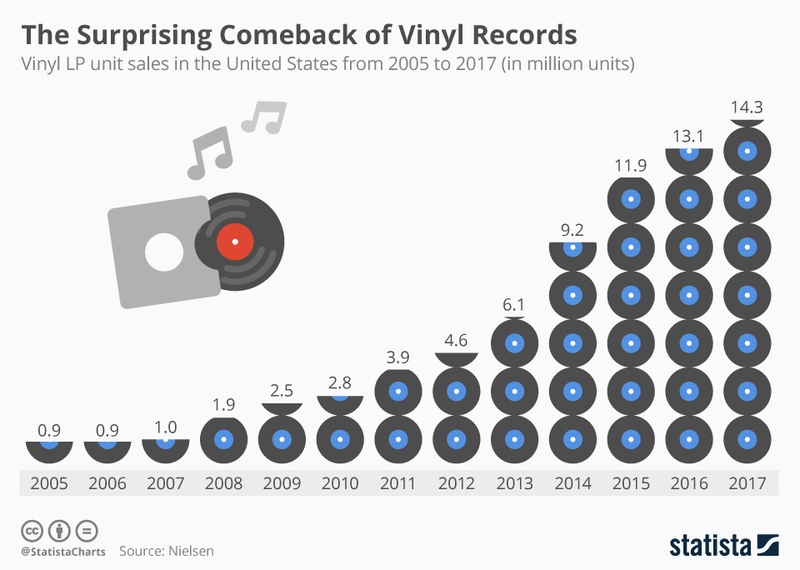 Estimates show that the true growth of vinyl may be more than double the numbers reported by the RIAA (which already show nearly 16x growth from 2009-2017). The music industry ignores used vinyl sales for two reasons. First, none of the money from used records goes to the artists, labels, or songwriters, who only receive money from the initial, new point of purchase. Secondly, the used record market is difficult to track. Many independent record stores do not report their sales, and many are not even asked for this information. An estimated 1,000 indie record stores do not officially report sales, which equates to approximately one-third of new albums sold. When the number of vinyl sold includes the pre-owned market, the resurgence of records becomes even more apparent. 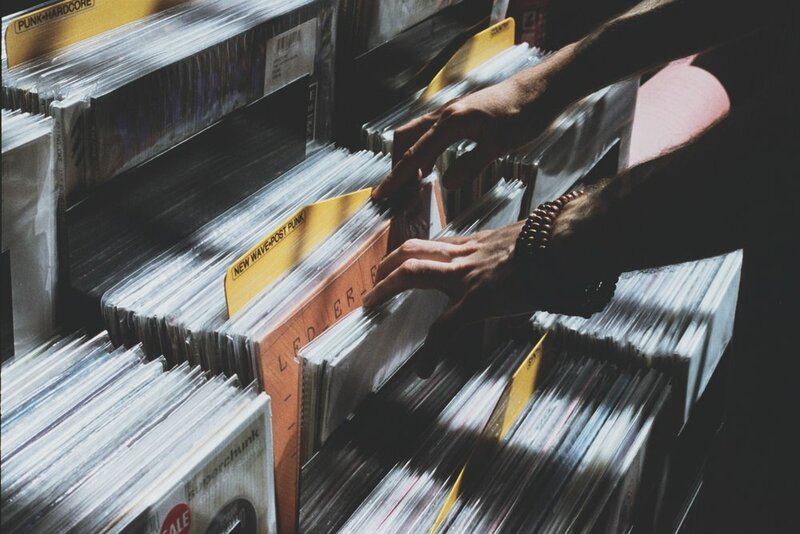 The used vinyl market includes massive players like eBay (more than 2.3 million vinyl on sale), Amazon (more than 900,000 vinyl on sale), and Discogs (5.7 million used vinyl on sale). These numbers suggest that around 9 million vinyl transactions are unaccounted for in recent industry estimates. With used vinyl and unreported sales estimates added to the mix, 2017 vinyl sales likely sit well over 30 million units, instead of the 14.3 million reported by RIAA. The increase in vinyl distribution will likely cause more artists to ramp up their focus on creating physical products. Physical album sales represent a large source of revenue for musicians that has been displaced with the dawn of online music consumption. While creating vinyl costs more time and money the skyrocketing return of the record makes the extra effort worth the investment. With the jump in sales, people must be buying the vinyl’s of today’s biggest music stars right? Well, not quite. The mainstream artists of 2018 have not yet breached the list of top vinyl sellers. Only six of the top 20 vinyl albums sold in 2018 were recorded in the last decade. Legends like Fleetwood Mac, Nirvana, Pink Floyd, Abba, and Queen lead the list. While rock albums have remained the most popular genre in vinyl sales (54% of all sold so far in 2018, though down from 67% in 2015), pop has gained a strong foothold, earning 14% of vinyl sales. Rap and hip-hop have risen to third place garnering 7% of overall sales. With the rising popularity of pop and hip-hop, these genres should continue to carve away at rock’s dominating vinyl market share. As vinyl continues the comeback, we can expect modern artists to make a conscious effort to improve their physical product. We’ll likely see special promotions, increased record player sales, and more current music rising to the top of the vinyl charts. It’s only a matter of time until vinyl becomes commonplace in the music industry (again).